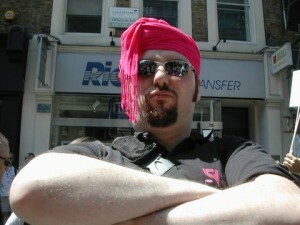 On the hot and sunny morning of the 1st of July, the Pinkies gathered in Baker Street. Resplendent in our black polo shirts, we were ready to step out in style for the EuroPride Parade 2006. As with all Pinkie events, there was an initial period of milling about and chatting while we waited for things to get going. This allowed plenty of time for Hsien and Liang to prepare their array of multimedia recording devices. It also gave Jonathan a chance to show off his improved conversational Swedish in a light-hearted discussion with Nathalina. Finally, with a chorus of whistle blowing, we were off. The Pink Singers were marching with other LGBTQ choirs and we had all been given placards to wave. A few of the tenors and basses were disappointed that their placards only displayed musical words like ‘Harmonise!’ or ‘Sing!’ and asked if there were any spare ones saying ‘Hello boys!’ or something similar. As we turned the corner into Oxford Street, we saw crowds lining both sides of the road and that Selfridges had put a special EuroPride display in the window to cheer us on. People were smiling and waving at us and the atmosphere was fantastic. 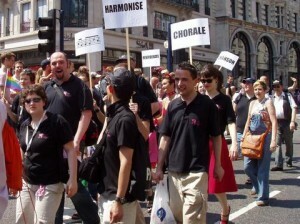 Onlookers pointed cameras and mobile phones to record a snippet of our magnificent musical celebration of Pink Pride. Of course, Hsien and Liang were pointing their own cameras right back at them. As we turned right at Oxford Circus, I thought about some of the Pride marches and demonstrations of earlier years. On one of these demos (in the late 80s or early 90s?) I remember we were marching along earnestly chanting ‘We’re here, we’re queer, and we’re not going shopping!’ to a handful of bemused tourists and indifferent others. The heaving hordes of people in Oxford Street, Regent Street and Piccadilly Circus all knew that we were there to celebrate EuroPride – and by being such a positive audience they were a part of the celebration too. Then the mood changed a little as the music float we were all following picked up its speed on the downhill straight, but meanwhile the Pinkies were unfortunately distracted by the free mini cans of fizzy pop being distributed at the side of the road. The Pinkies were scattered all over the place and Mamma Lynne was far off ahead of us! There was some urgent and inelegant scurrying, plus a few cries of ‘Come on Pinkies . . . hurry UP!’, but we were all reunited by the time we passed Trafalgar Square. Hsien and Liang’s multimedia devices were getting a thorough workout as we sang our hearts out along Whitehall and past Big Ben onto the Embankment. This really was a great parade route as we got to show our Pink Pride and have a lovely walking tour of London highlights at the same time! When we reached the dispersal point it was hard to stop singing so we did a quick impromptu performance of They Don’t Know About Us on the steps of Charing Cross Station. We were ready for more, but our gathering audience was beginning to cause a problem for the EuroPride stewards and so we moved on. With the long hot walk behind us, it was now time to relax together on the grass under a shady tree and celebrate Fran’s birthday. What a lovely celebration it was too: Pinkies & Pimms – a classic combination. Happy birthday Fran and congratulations on your excellent organisational skills in producing glasses of Pimms with ice for the whole choir right in the middle of EuroPride! Then finally the Pinkies began to drift off to their next thing. Carol, Claire G and other diehard footie supporters went off to watch the World Cup. Some of us went to listen to the speeches and visit the variety of ‘issue’ and campaigning stalls in Trafalgar Square. Others decided to chill out and hear some of the poptastic all-day entertainment in Leicester Square. Many Pinkies eventually headed to Soho to enjoy the splendid Pinkness which was there in abundance. Sally was in Soho Square with a stall displaying some of her lovely Exclusively Eve goodies and there were many other booths selling all kinds of very interesting items. The Soho streets were absolutely crammed with all kinds of people wearing all kinds of things who were enjoying the sun and the fantastic Pinkness of the day. Even the people waiting in line for the portaloos were in a party mood. Huzzah for EuroPride! What a fantastic day this was. I can remember the years when the Gay Pride March was a demonstration against government and societal oppression and a demand for equal rights. It was our chance for our voices to be heard but somehow the march was always along the back streets and then the Pride Festival (stalls and music) was held in some local park way out of central London. I can remember years when marching was free but you had to buy a ticket to enjoy any other aspect of the day. I sometimes made the choice to miss out on that year’s Pride Festival or Mardi Gras Party or whatever the latest incarnation was. But at least that was my own choice not the inevitable result of my economic circumstances. I am so proud that our great city of London was able to put on such a fantastic, free, accessible and inclusive celebration of Pink EuroPride. We’re here, we’re queer and we totally rock! Thank you to all the organisers, committees, volunteers and other magical fairy folk who made this fabulous day possible. I hope that all the Pink People (Lesbian, Gay, Bisexual, Transgendered, Queer and/or Questioning) out there who didn’t make it to this years Pride will be able to join us for next year’s celebration. It’s on Saturday 30th June 2007 if you need the date for your diary. I’m proud to be Pink and I’m proud to be a Pinkie!